It will take effect once it is published in an official newspaper. Ukrainian President Petro Poroshenko has signed the law introducing martial law in 10 regions of Ukraine, his spokesman Svyatoslav Tseholko has said on Facebook. 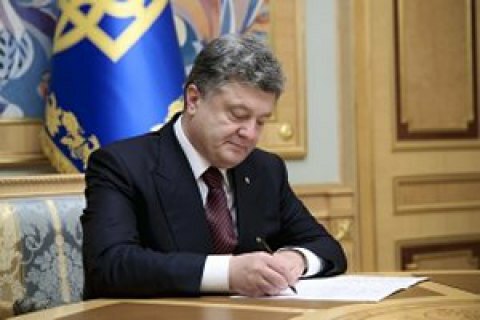 "President Poroshenko has signed the law to endorse the decree 'On the introduction of martial law in Ukraine'," he said. The law and the decree on martial law will take effect simultaneously once they are published in official newspapers. Martial law is being introduced for 30 days in Chernihiv, Kharkiv, Sumy, Donetsk, Luhansk, Vinnytsya, Zaporizhzhya, Kherson, Mykolayiv and Odessa regions. The decision to introduce martial law after Russia fired on and captured three Ukrainian naval ships, wounding at least three Ukrainian seamen, off the Kerch Strait on 25 November.